Just a handful of hours after the club won their first test match of the summer, the 1. FC Köln scored an even-bigger win with the revealing of the new uniforms/kits/strips for the 2016-17 season. The ad copy attached to the announcement might be underselling the brilliance of the new looks with the “no frills” proclamation. What all three (home, away, and contrast) uniforms lack in “frills” they have in classic, clean appeal. The home kit emphasizes the “all white” look by being pretty much all white with few obvious design elements. If you look closer, you note there are some wide sublimated vertical stripes in the fabric, but they are very subtle. Everything else is just clean, clean, CLEAN! Even the socks are all white with just the crest and outfitter logo on them. 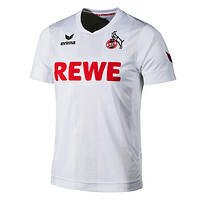 The look screams “classic effzeh” and is an instant winner. The away uniform is essentially a photo negative of the home. Everywhere you see red on the home, you see white on the away and vice-versa. Unless you have an aversion to red, everything that applies to the home look can be said for the away, with the exception of sublimated stripes; those are not here. One bonus with the red shirt is a thin strip of material running up each side. Small images of the FC badge just apparent in the strip. From the photos in the fan shop, it’s difficult to tell for certain, but they may be stitched, which would be impressive. Whatever the case, it’s another subtle and winning design element. But the big winner may turn out to be the Ausweich (contrast) or ‘third’ strip. Gone are the awkward shades of blue of the last few seasons and in comes a very alluring charcoal gray top with black shorts and socks. 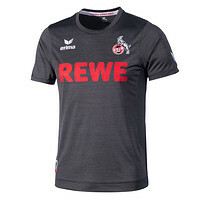 The third shirt has the same side strips with Hennes on the Dom running up the side, but this strip IS black, making it stand out a bit more on this shirt than on the away. Even the goalkeeper jersey deserves a bit of applause. Usually, Timo Horn’s shirts come off as a bit of an afterthought, somewhat from the necessity of the keeper needing to be easily distinguishable from outfield players even when in heavy traffic. This year, that is not as much the case. Somewhat reminiscent of last year’s away shirts, the keeper jersey this year is red with the darker red horizontal stripes running across the trunk. These stripes, constructed of a collection of dots, alternate between thin and thick. It looks nice! The one problem I can forsee is that it won’t be allowed to be worn when the team is wearing the away shirts and also not when the opponent is in red. Without knowing the specific rules regarding the keeper’s uniform color, I can’t say for sure, but it seems like there’s a chance we won’t see Timo wearing this top all that often, which is a shame. Otherwise, if you ever wanted to buy an FC keeper jersey, this might be the best year for that, ever! Which jersey do you prefer? What name and number will you get on the back of yours? Remember, the fan shop has facilitated shipping to the USA and accepts PayPal. Be the first to comment on "1. FC Köln Uniforms for 2016-17 are Here . . . and they are GORGEOUS!"